3. 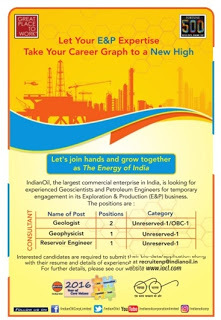 Reservoir Engineer - Post graduate in Applied Geophysics / Geophysics from a reputed & recognized Institute / University in India or abroad + Working experience of minimum 25 years in upstream Oil & Gas sector in India or abroad specially in the area of Oil & Gas exploration with at least 5 years of experience in field. 2. Most recent passport size photograph should be pasted on the application form. • Duly filled in application form, along with proof towards date of birth, educational qualification and experience is required to be scanned as .pdf file. 4. Candidates must have an active e-mail id, which must remain valid for at least next one year. All future communications with the candidates will take place through e-mail only. 5. If more than one application is received from a candidate, most recent (current) application will be considered as final.